As you all know by now, we just released an update to our Day & Night Era themes. Since, we're on a new version, it's time for a new bug report thread. Hence, we're clearing out the old report list, and starting from scratch. Remember: Please keep in mind that key members of the team are volunteers from the community; feedback should be politely phrased and respectful of the work they've put in. If things get out of hand this thread will have to be locked. iPad pro no longer getting mobile. Width resizing noticeable for users who choose the max width option. IE11 issues are known. 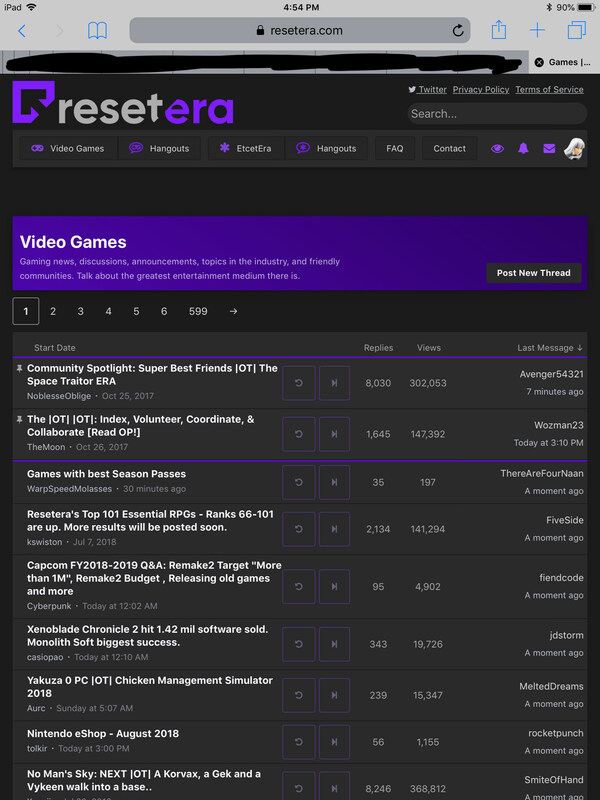 Our recommendation is to stick with legacy themes. 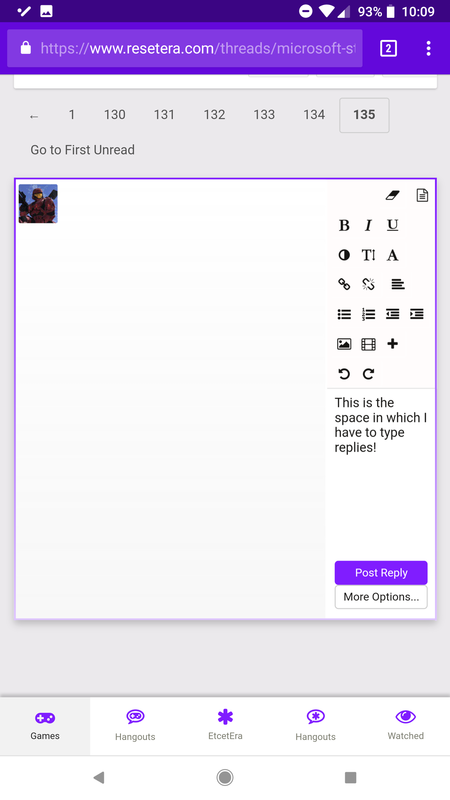 Post reply box also not displaying properly on said devices. Avatar too large on certain devices. Certain devices experiencing issues where text expands past screen. And weirdly, avatars sit on top of posts now. It looks like you’re already aware of some iPad issues, but since this one is rather specific, I thought I’d mention it. 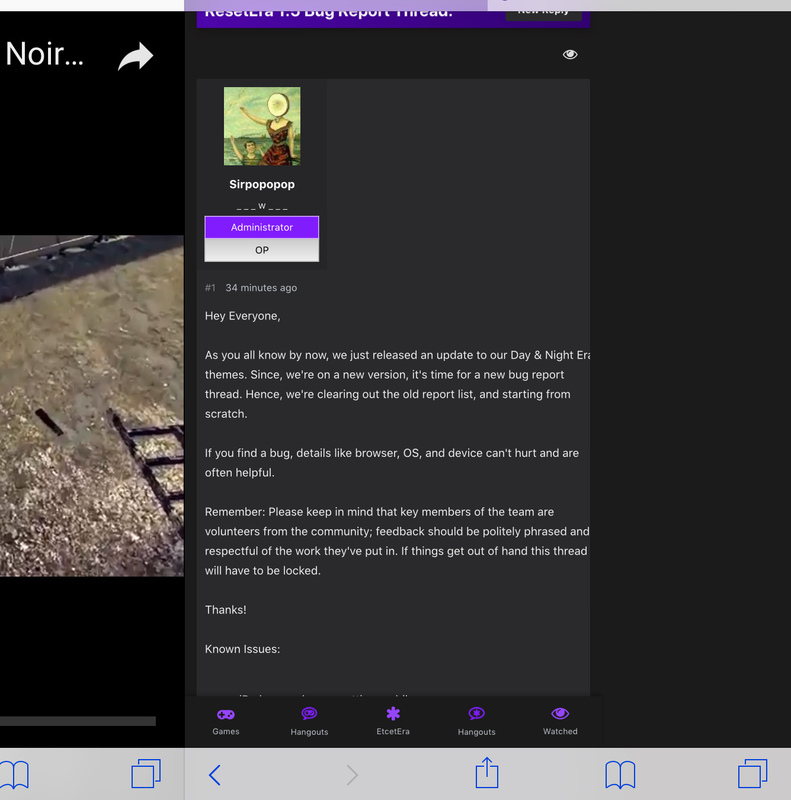 Has anyone else lost he pop-up menu at the bottom of the screen which was recently added to mobile, which shows big button links for watched threads, hangouts etc? I’ve not been seeing it for the past few days. 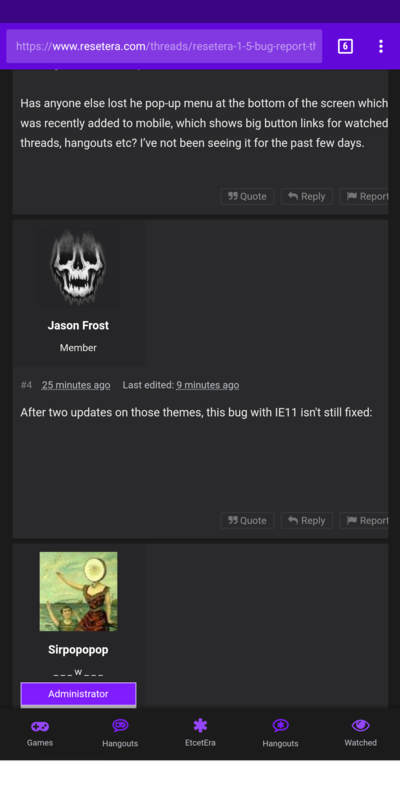 After two updates on those themes, the bug with IE11 isn't still fixed. After much debate, the team decided to not focus on IE11 issues. Can you share a screen of what you are seeing? Along with the device/browser? So, you are going to ignore all these users? Layout issues are still prevalent. 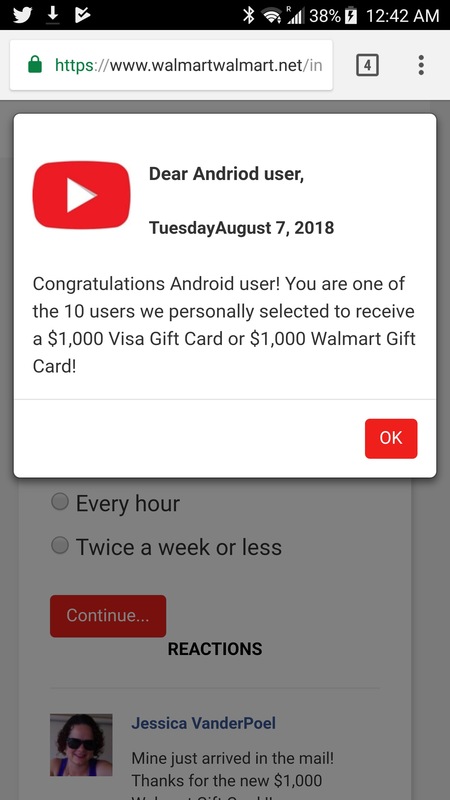 This is what I see on Chrome on my pixel 2xl. 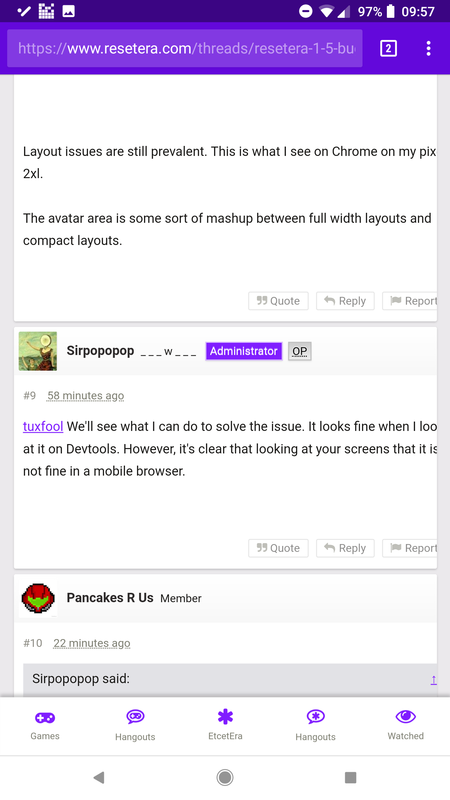 The avatar area is some sort of mashup between full width layouts and compact layouts. tuxfool We'll see what I can do to solve the issue. It looks fine when I look at it on Devtools. However, it's clear that looking at your screens that it is not fine in a mobile browser. It’s difficult to show it because I need to be scrolling for the link menu to appear at the bottom of the screen. In any case, I’ve taken a screenshot whilst scrolling. However, I’m on mobile and can’t see a way to attach the image, is this possible? 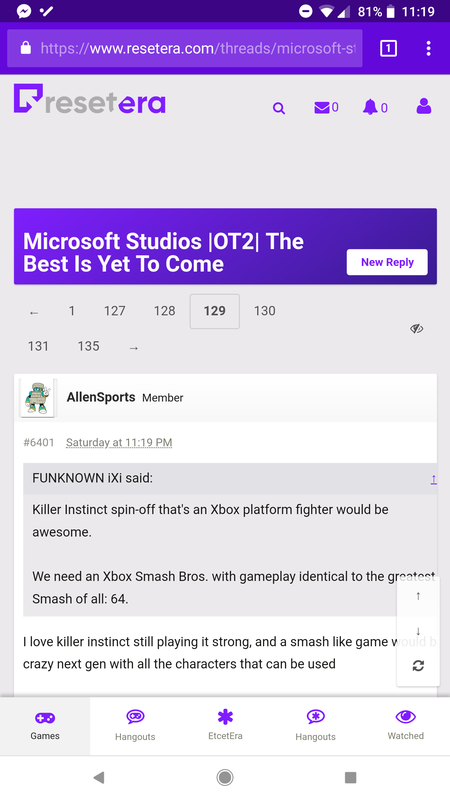 If it helps, I’m referring to the link menu which appears in tuxfool’s post above. I’m using an iPhone 6, iOS 11.4 and Safari. I have the exact same issue on Night Era. Interestingly, I have a different set of problems on DayEra. Also the choose theme button doesn't seem to be visible on most pages on DayEra. I absolutely don't blame you staying away from IE 11, but could you make this information clearer than it being buried in a post on the bug thread. 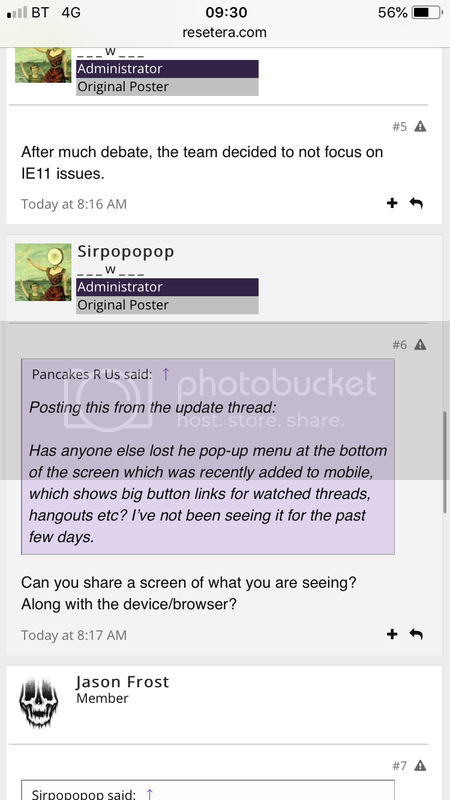 Can the OP in the v1.5 launch thread list the current status of IE 11. Is support coming later?, is ongoing support currently under discussion? or is support currently dropped and IE 11 is now legacy only. Can A known issue regarding IE 11 be added to the OP in this thread? As I'm forced to use IE 11 at work (which is likely to change in the not distant future but for others it may not) I'm used to websites telling that my browser isn't supported, but the key point is this was usually well communicated in advance and is well communicated now (Usually a banner). So at the very least a update on the status in the V1.5 thread would be welcome and maybe in future a banner for IE 11 users telling them to use the Legacy themes and explaining the support status of IE11 would be good. The page number buttons go over two lines. Those black boxes seem to still be happening for me on Firefox mobile in NightEra. There's got to be a better way to do max width without the site momentarily reverting to minimum width and then expanding to max after every single refresh. Pages numbers aren't showing on hover anymore. NightEra/Win 10/current version of Edge. I’ll update the OP of this thread to indicate IE11 support will not be forthcoming, and it is best to stick with legacy. I’ll let Cerium know to update the other thread with that information as well. I'm fine with getting a screenshot while it is not scrolling. I'm more interested in the behavior where the bottom nav bar is not appearing, then behavior where it is appearing. The avatar issue mentioned by tuxfool should now be fixed. Quick reply box issue should be fixed as well. Moving it to solved. The text overflow issue should be solved as well. Moving it to solved. Until a couple of days ago, I was seeing the bottom nav bar. No longer, unfortunately. Let me know if you need anything else. Thanks. Nice job sorting out the NightEra issues so quickly. For the first time Era is actually fairly usable on my phone. 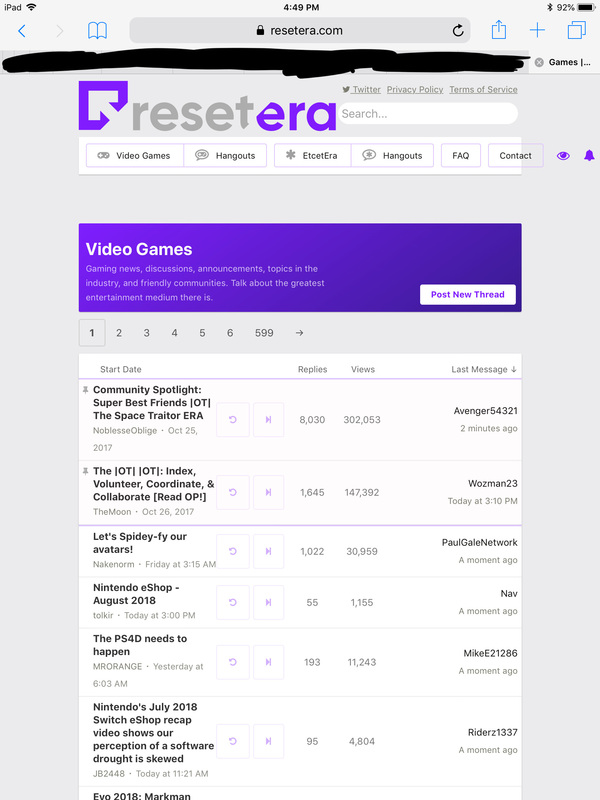 Right now you are seeing the legacy lightEra. Try manually switching to DayEra in Choose Theme. Let me know what happens after that. I just switched to DayEra and the nav bar is back, hooray. Does it remember this setting for when I visit on desktop? I recently switched theme on my Surface Pro 4 because it only displayed the mobile site and not the desktop one. Switching the theme sorted it on there, and I guess maybe that’s when the nav bar disappeared on mobile. Themes are saved to your user profile so when you change devices your preferences will remain the same. Oh, ok. I guess this means forced mobile mode browsing when I go back to my Surface, unless that bug has recently been fixed? That bug should be fixed. Can we put forth feature requests in here? PtM - I'll need to consult with other members of the team before making such a thread. I am still seeing broken scaling on iPad Pro 10.5" on DayEra when in portrait orientation. On DayEra, the notification and profile icons extend out of the header, and the page margins are gigantic. Neither of these issues occurs in NightEra. This has been true since 1.4. Note the messages, alerts, profile icons in the upper right being pushed out of the bar. Yes, the screenshots are old, but I just checked the issue on my iPad right now, and it's still present. Uploading screenshots from iPad is a pain, so I reused the old ones. If you can get me some new screenshots, that would be much appreciated. I think I see the issue you are alerting me to, but it appears different on my screen, so I am having some issues determining if any fix I apply will fix the issue you are presently facing. When you expand the page width to "Max", sometimes you can see the screen with the old margins before it "pops" to full screen. If you can get me some new screenshots, that would be much appreciated. I think I see the issue you are alerting me to, but it appears different on my screen, so I am having some isues determining if any fix I apply will fix the issue you are presently facing. Alright, brand new screens as requested. The Twitter link on the profiles isn't correct. When I go to he quick reply box and the bottom and tap on it to type my reply, the view zooms in a little and I can’t see everything I’m typing (on the right side of the box). Need to manually zoom out. Can this be fixed, please? I'll pass along the ad redirect issue. 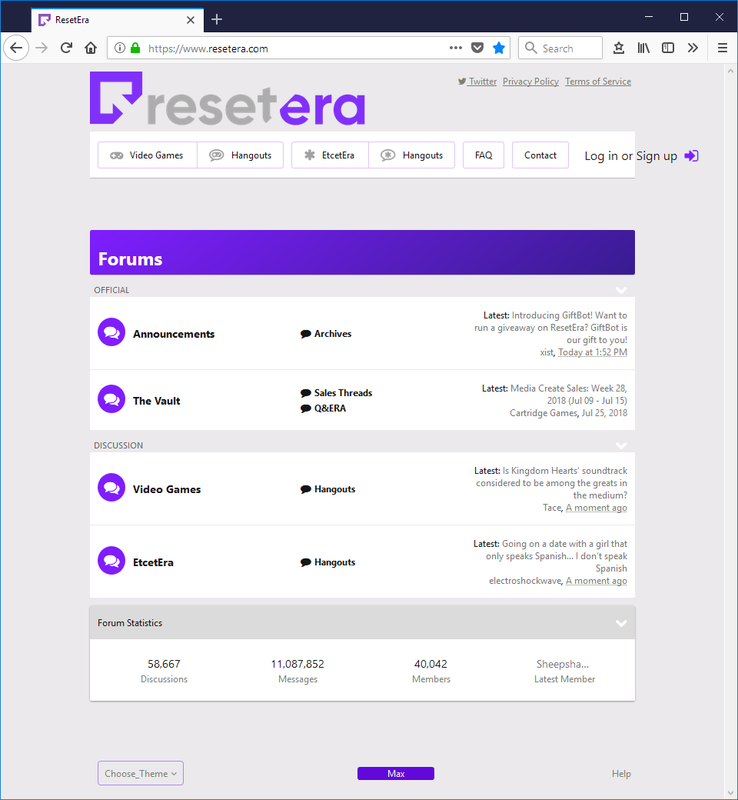 I mentioned ad redirects with dialog boxes in the 1.4 thread .... and just got another, this time have a screenshot. The text starts wrapped and then it appears additional CSS loads in and causes the page to shrink. The further you are down the worse the jump is and often causes accidental clicking of the wrong link. A similar issue happens in the thread itself. There seems to be some logic to jump to a particular post but that script can load many seconds after the page loads which is incredibly disorienting. 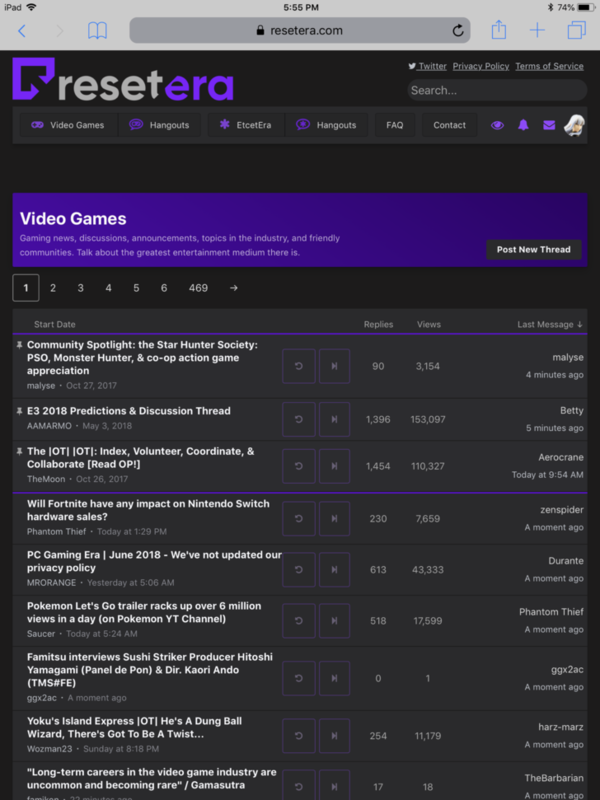 You can also notice shaking of the UI as things load in and the page resizes. These are much less noticeable on a desktop machine because the assets generally load faster. Try throttling the network in dev tools as well as the CPU to better see it. These issues aren't new but I'm not sure how aware you were. Yeah, I think I have some theories on why this is occurring, but I need to test them out before posting a response. I'd consider this part of our technical debt. Thanks for the feedback. I have some awareness of the issues Era has for users with a lower bandwidth. I would like to get a handle on solving these issues one day, but it might not be the most immediate concern. Yes, I recognize this is limiting, but our resources aren't large enough to get a handle on these issues easily. This probably isn't the answer you want here, but I appreciate you bringing it up. 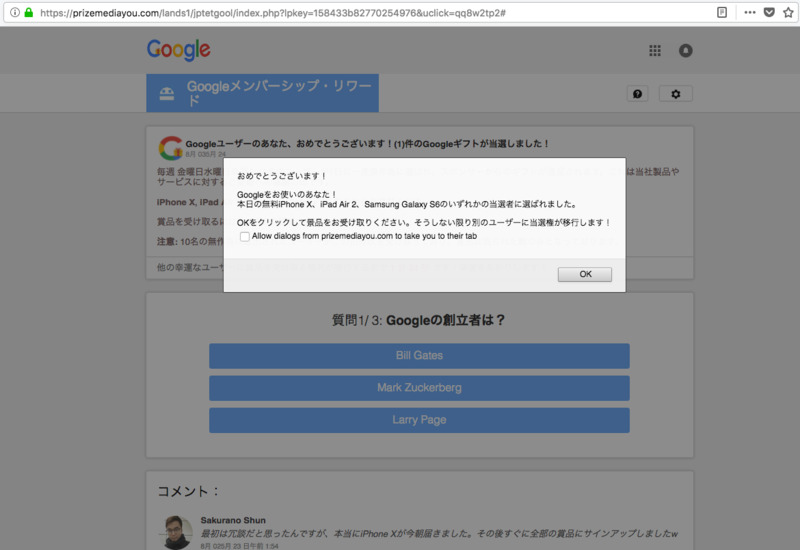 The "Log in or Sign up" link overflows the header area when the window size is somewhat narrow. I tested this in Firefox 61.0.1 but I verified that it affects other browsers as well. Is this the right thread to complain about a redirect to a fake "you won!" Walmartwalmart website? 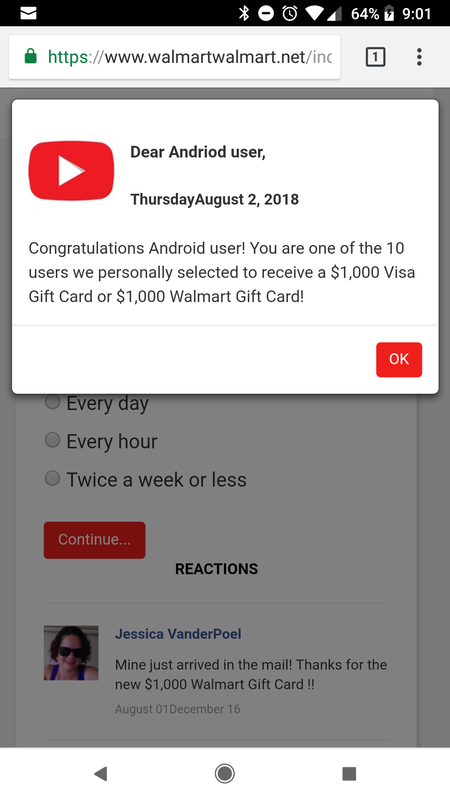 Just started getting the same exact redirects. On mobile. No ad block and I'd like to keep it that way but not if I get too any more of these. Just came in to report that Walmart Walmart redirect.